Kotobukiya’s Marvel Comics ARTFX+ series has brought a range of characters—from the Avengers, X-Men, and most recently the street-level heroes of the Defenders—to life in stunning detail in 1/10 scale. Next, the spotlight will return to the Avengers as we showcase several characters based on designs by Adi Granov!Adi Granov’s art is once again brought to life by sculptor Junnosuke Abe (RESTORE). At 1/10 scale, these ARTFX+ statues are perfect for displaying alongside your other Marvel ARTFX+ characters.The first entry in this new series is a character whose recent film has enjoyed record-breaking success, Black Panther! A hero with legendary strength supported by his Vibranium suit and advanced Wakandan technology, the king and protector of Wakanda is expertly recreated in Adi Granov’s original style thanks to Kotobukiya’s superior craftsmanship. 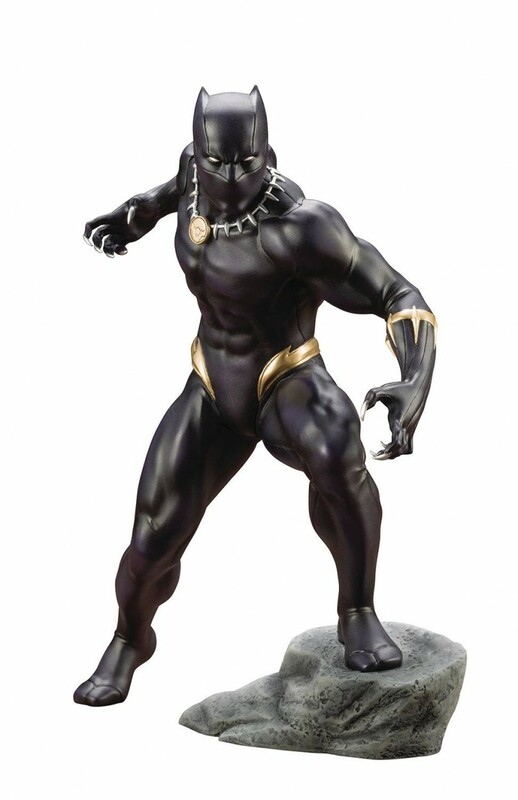 Like the other characters in the series, Black Panther is perched on a special diorama base that reflects his appearance in the concept art. With one foot perched on a raised stone, the height and slant of the base gives the statue a unique vertical silhouette and will give the entire group of heroes a dynamic appearance when the collection is complete.